AMC Theaters is giving away a limited edition poster of Star Wars: The Force Awakens to those who see the film in IMAX 3D. AMC revealed the poster on Twitter earlier today, and will be giving away copies every Sunday from December 20th to January 10th. You can check out a link to the Tweet here, and check out the poster below. The poster is gorgeous. 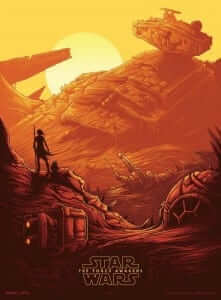 It features what seems to be Rey, Daisy Ridley’s character, standing on a large sand dune next to what looks like BB-8. Coated in a beautiful sand-like tint, Rey is looking at the downed Star Destroyer, along with what seems like a graveyard of ships and robots. 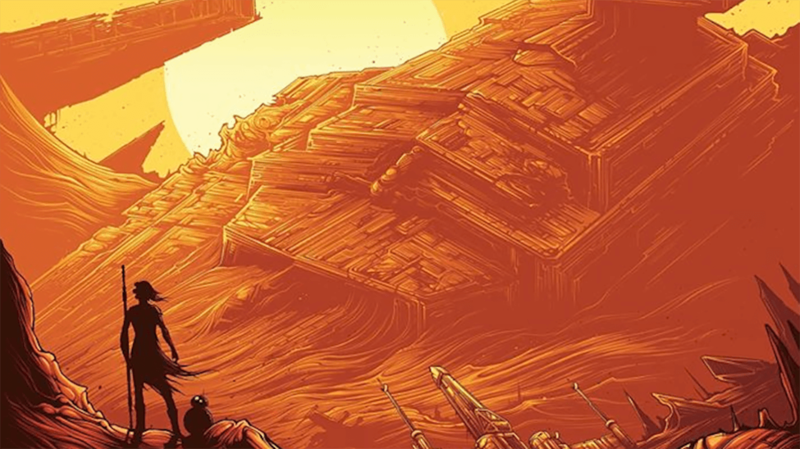 Could Jakku, which is presumably the location of the poster, be the next Hoth? Check out the new Star Wars trailer! Star Wars: The Force Awakens comes out December 18th. Are you excited? Will you hang this poster up on your wall? Sound off in the comments below! Liam has been watching movies and too much tv since they took Batman: The Animated Series off the air. He can be found on Twitter tweeting and retweeting nonsense.